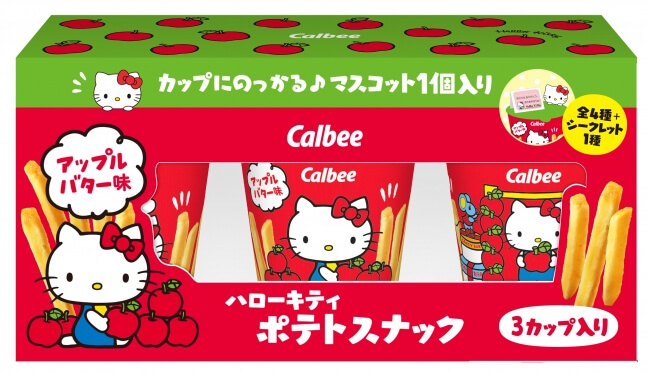 Calbee has teamed up with popular Sanrio character Hello Kitty and will begin rolling out a new apple butter flavoured potato snack at select Don Quijote stores from the Tohoku to Kinki areas of Japan from March 27. There are three different Hello Kitty cup designs that the snacks are packaged in. Each come with a Hello Kitty mascot that can sit on the side of your cup. There are 5 mascots in total―four which use designs we have seen before and one secret design. Hello Kitty is known for loving apple pie, and so the crunchy potato sticks are apple flavoured with a touch of butter to complement the acidity of the apple. These make for a perfect souvenir for fans of Hello Kitty and Japanese snacks.